Welcome back to the Raptors Republic NFL Dynasty League! Let me know by July 13th that you are in fact coming back. We'll have a wait list for other interest people who would like to join. If you miss the deadline your entire roster will be carried forward and you therefore forfeit your draft picks. For every player kept above 25 players, a draft pick will be forfeited starting at round five and progressing to round 1. Last edited by Apollo; Fri Aug 17th, 2018, 10:16 AM. I counted 8 podium finishes fpr you but we are only going into season 7 lol nice try! Heckuva run you're on... this is my year though. Just like it's the Raps year! Thanks but that's all I need is you swooping in for a Chip and bumping me into 4th place this season! We need to talk lottery. I'm out of the lottery again this season. Should I get someone outside the league to draw these or are we ok with me doing it again? For Keeper last year Joey was nice enough to assist seeing how I was actually in that lotto. That would be cool if Joey did it. This is my year to get #1 and he's gonna make that happen, in the most fair way possible. Last edited by Apollo; Wed May 2nd, 2018, 01:23 PM. WR	- Odell Beckham Jr.
DL	- Dante Fowler Jr.
Last edited by Apollo; Tue Jul 31st, 2018, 10:13 PM. 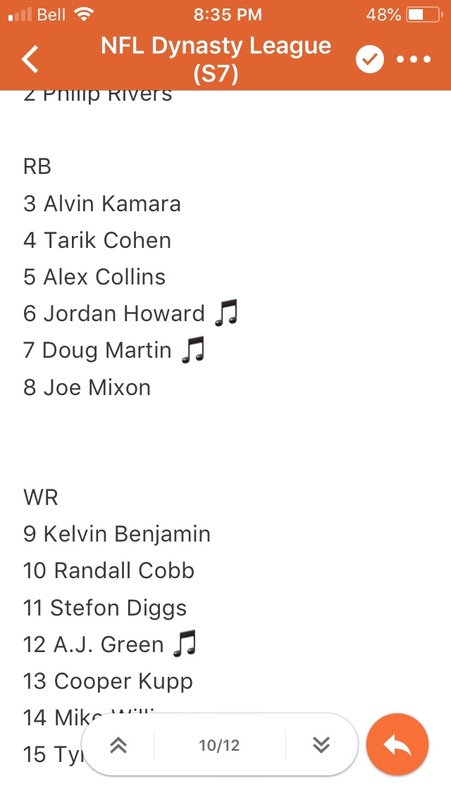 Reason: Added Dion Lewis. Happy to bring back a healthy Watson and expecting some young studs to emerge from my backfield group of Collins, Kamara, Mixon and Cohen. Add a top end pick, and I'm going to end my podium drought since my wild rookie season. Does anyone else see musical notes on my post above beside some of the names? no music notes, but two bars... like an = sign with its mouth open. Personally, I'm seeing rectangular boxes with X's in them. This is the part where Axel tells Mack and I that this was some sort of test we both failed.